A few months ago, a non-traditional student at my university asked would I be willing to meet with her and her 16-year daughter to discuss poetry and other readings. Sure, I said. So we met, talked, and I let the high school student borrow a few works from my bookshelf. She chose books by Langston Hughes, Gwendolyn Brooks, and Colson Whitehead. 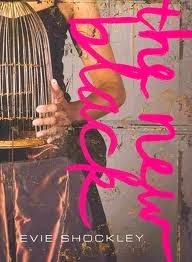 I suggested that she also take Evie Shockley's the new black. When I met with the high school student and her mom a month later, she asked could she keep the new black a little longer because of how much she enjoyed reading and re-reading the poems. Certainly, she could keep it longer. After the meeting, I emailed Evie and informed her about the encounter with the student. I mentioned the student's name, and a few days later, guess what came in the mail? Yep, the new black, with an autograph, and a note from Evie to the high school student. At our last meeting with the student and her mother, I asked the student for an exchange: I retrieved my copy of the book and presented her with her own autographed the new black. When she saw that the book had a note from Evie to her, she was in shock for a moment. She then actually hugged the book and whispered to her mom, "I'm keeping this forever." After reading and re-reading and re-reading the note from Evie, the student looked up and asked, "How? How did this happen? How did you get this?" She asked with a sense of wonder that sounded like she was basically asking "Hey Mr., how did you pull that rabbit out of your hat?" or "Hey Superman, how did you leap over that tall building?" Really, this 16-year-old assumed I possessed some kind of magical powers. A little while back, I mused about the sci-fi features of Evie's work. Maybe, I should've gone further and wondered about her sorcery or voodoo abilities. I mean, how else do we explain a poet who writes a short note that can transform a teacher into a superhero?